The Chevy Malibu is a fixture on the roads of Danville and Bloomington, but why is this sedan such a superstar with Illinois drivers? The answer just may lie within the Chevy Malibu interior! The cozy cabin is packed with space-saving features, high-tech conveniences, and even luxuries that you might not expect! Let’s dive a little deeper into the Chevy Malibu specs. Year after year, the Chevy Malibu interior consistently impresses customers and critics alike – thanks to a smart design that maximizes every inch of space in this midsize sedan. Seat five guests comfortably with 102.9 cubic feet of passenger space to explore, along with 15.7 cubic feet of trunk space. Adjust the 60/40 split rear seats as needed to open up extra room for cargo, or keep the seats up to bring the whole family along for the ride. Options like cargo nets and trunk organizers create a tidier space, while available luxuries like leather-appointed seats and heated steering wheel add an upscale feel to every drive. Listen to your own travel soundtrack with the standard 6-speaker audio system, or upgrade to the premium Bose 9-speaker audio system for truly surround sound. An 8-inch diagonal color touchscreen display acts as your vehicle’s infotainment center, offering access to available Apple CarPlay and Android Auto with just a tap. Need access to the fastest auto internet connection around? 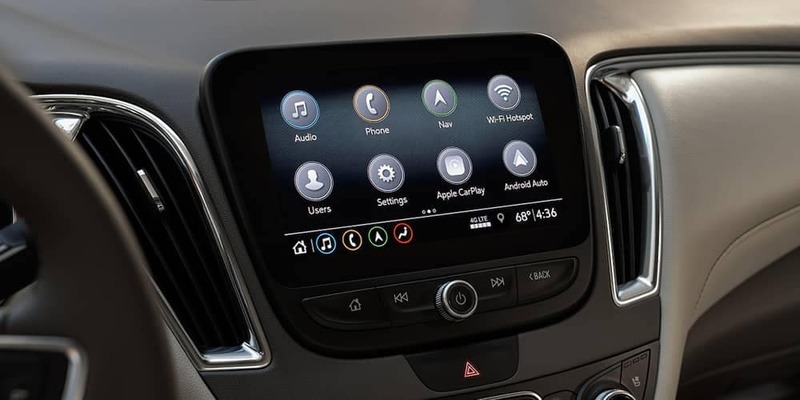 The Chevy Malibu specs include support for available 4G LTE Wi-Fi hotspot technology. No need to fumble with a keyring with Keyless Open and Keyless Start, standard features across all of the Chevy Malibu trim levels. If you’re in the Decatur area, drop by Sullivan-Parkhill to get up close to the Chevy Malibu interior. Our experts would be happy to take you on a test drive, so you can experience the Chevy Malibu specs from behind the wheel! Check out our Malibu inventory for a sneak peek, and contact us to get started.